We can't wait to see you this Sunday! We are finishing off our series Journey through John this week. It has been a great trek. You don't want to miss this conclusion. The first week in March we are starting a new series in the book of Acts called "In Search of Church." We will look back at the early church to understand where we came from, who we are, and where we are going. Are you a Christ-follower? Have you followed Him into baptism? If you have been thinking about it, then please consider our upcoming opportunity for baptism on the 25th of March, Palm Sunday. It's a great way to kick off Easter week. 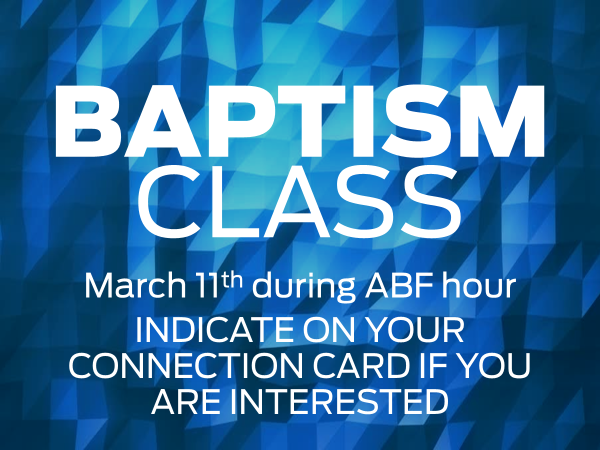 If you decide that you would like to be baptized then, please sign up for our class on March 11. Help make our Easter celebration an amazing outreach. We will have invites for you to share with your friends and family. You can also make the celebration special by contributing candy to the Easter Egg hunt. We need the candy by March 18th so we can load up the eggs. On March 18th, we are having a very special day. We will be celebrating the 45th Anniversary of Woodland Shores with cake between the worship service and our Church Family Meeting. It will be a great time looking at where we have come from, where we are now, and where God is leading us. Again, can't wait to see you this weekend! God bless your week! Remember, YOU ARE LOVED!